Every major and not-so-major auction house holds its 20th Century Decorative Arts sale in December. It makes for a very busy month. Sotheby’s held three decorative arts sales on December 16th. In my previous blog, I covered the superb results of the Important Tiffany sale. Today I’ll review the results of the Important 20th Century Design sale, which grossed $6,933,688, despite the failure of the cover lot to sell, a Greene & Greene desk and chair from the Pratt House of Ojai, CA. The first section of the sale was devoted to Arts & Crafts furniture, ceramics and lighting. The strong results probably had most of the consignors smiling. The top lot of this section of the auction was a Greene & Greene lantern, one of six that had been removed from the Blacker House in Pasadena, CA. It sold toward the lower end of the estimate of $400,000-600,000, realizing $470,500, including buyer’s premium. It’s curious to note that the following lot, #31, another of the six Greene & Greene lanterns, failed to reach reserve and did not sell. Rare and impressive examples of Arts & Crafts ceramics all sold well, with one Teco vase doing exceptionally well. 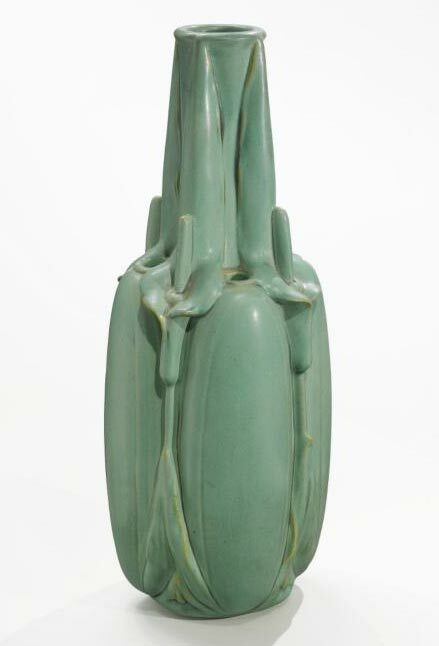 Lot #23 was a rare 17″ Teco Calla Lily vase, estimated to sell for $80,000-120,000. It soared to three times its pre-sale estimate, to sell for $314,500. Gustav Stickley was well represented in the sale with furniture and metalware. 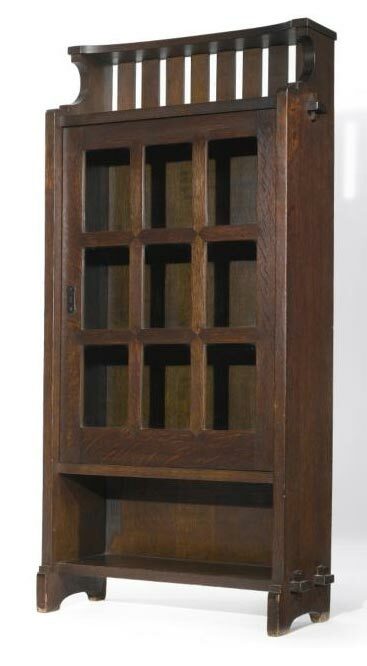 A rare book cabinet, lot #38, sold for $194,500, against a pre-sale estimate of $80,000-120,000. Other superb results from the sale were a cire perdue René Lalique statuette ($602,500), a cire perdue René Lalique vase ($494,500), a pair of armchairs by Emile Ruhlmann ($410,500) and a dining suite by Claude Lalanne ($386,500). For the complete results of the sale, click on the following link: Sotheby’s Important 20th Century Design results. If you read Monday’s blog, you know that better Tiffany Studios items were very strong at Christie’s Important Tiffany auction on December 15, 2010. Sotheby’s followed the next day with their Important Tiffany auction, also with impressive results. With only 33 lots for sale, the auction grossed $5,583,375. The top lot of the sale was the cover lot, #221, a rare Grape table lamp, in the shape of a Wisteria. 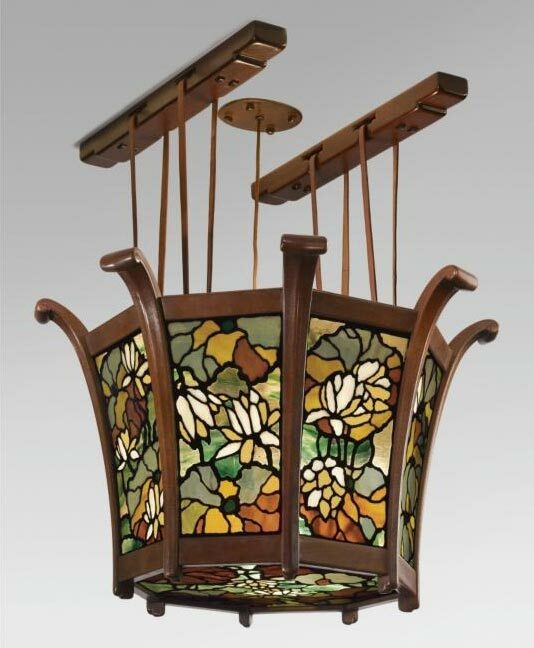 Estimated to sell for $400,000—600,000, it realized $1,202,500, including buyer’s premium, doubling the estimate — an understandable result for a beautiful and rare Tiffany Studios lamp. So how do you explain the following result? Lot #232 was a Tiffany 20″ Daffodil table lamp — a nice example, but certainly not remarkable. On a good day, it might have sold for $100,000. On this day, it sold for the extraordinary price of $512,500, against an estimate of $50,000-70,000 — 10 times the estimate. The consignor must have been giddy. And why not? It’s the equivalent of winning the lottery. The only sensible explanation is that two bidders who have more cents than sense (my mother would have liked that one, too), were bidding against each other. Pride and competitiveness won out over logic. All one of them had to do was to go into a shop on Madison Ave. and buy a similar lamp for a fraction of the price. 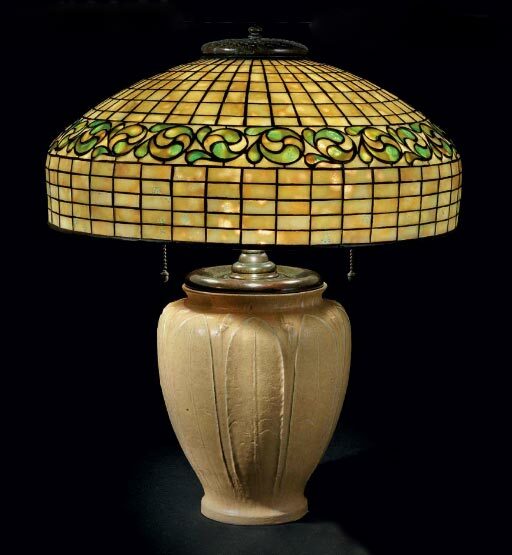 Another six Tiffany Studios lamps sold for over $250,000, for a total of eight. They included a Laburnum ($842,500), a rare Landscape floor lamp ($842,500), and a Peacock table lamp ($410,500). Only a few lots of high quality Tiffany Favrile glass were offered, all selling well. A beautiful wheel-carved vase, lot#203, sold for $50,000, against a pre-sale estimate of $8,000—12,000. For the complete results of the sale, use the following link: Sotheby’s Important Tiffany results. This past week saw the major New York auction houses hold their 20th Century Decorative Arts sales, which included a significant number of Tiffany Studios items. What became clear is that the upper end of the market is sizzling, while the lower end of the market is fizzling. (My mother would have liked that one.) Today, I’ll discuss the Christie’s sale and on Thursday, the Sotheby’s sale. Christie’s held their Important Tiffany sale first, on December 15, 2010. The sale included several important lamps and a gorgeous window, lot 252. The estimate of $100,000-150,000 gave no clue that it would become the star of the sale, realizing the incredible price of $962,500, including buyer’s premium. In retrospect, it shouldn’t have been that much of a surprise — first, it was gorgeous and second, it had impeccable provenance. It was installed in the Darius Goff House in Pawtucket, Rhode Island in 1893 and remained there until early in 2010. Also in the sale were a Wisteria lamp ($842,500), a Snowball (Hydrangea) floor lamp ($482,500), another Wisteria lamp ($482,500) and ten more lamps selling over $100,000 each. Another nine lamps sold in the range of $40,000 to $86,500. 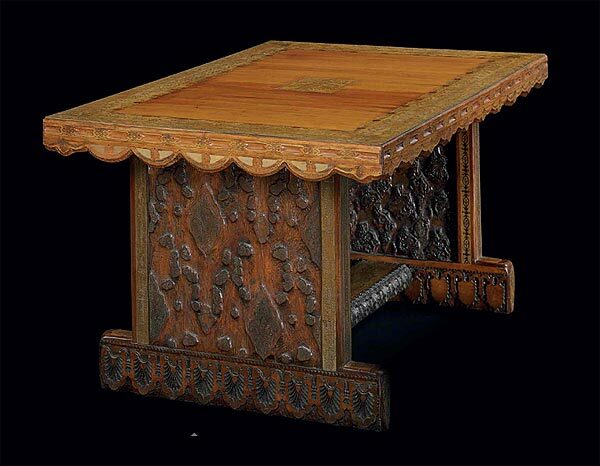 One of the more unusual Tiffany offerings was an early 1881 cherry table with brass inlays, from Tiffany’s own home at the Bella Apartment House in New York City. Estimated to sell for $150,000 – $200,000, it sold within the estimate for $182,500. 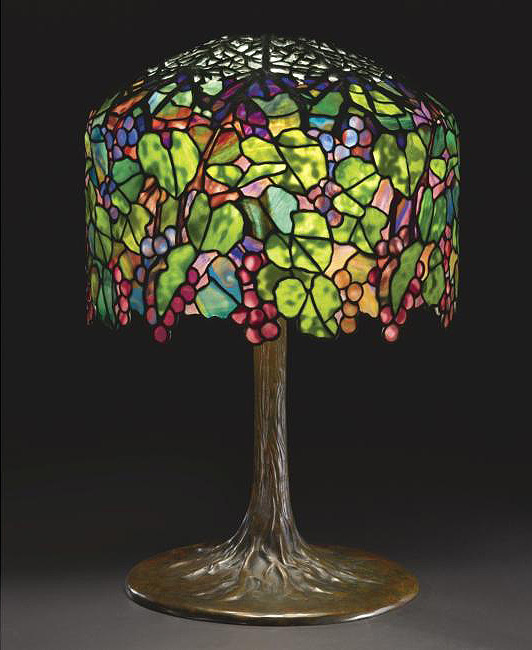 Simple Tiffany floral lamps and geometric lamps were under-appreciated at the Christie’s sale. There were some serious bargains, especially for Arts & Crafts buyers. An 18″ yellow Lemon Leaf table lamp with a matching Grueby base, with Jordan-Volpe Gallery provenance, sold for only $15,000, including the buyer’s premium. Kudos to the buyer for picking off this one. For the complete Tiffany results from Christie’s, click on the following link: Christie’s Important Tiffany results. Sotheby’s New York will hold their sale of Important Tiffany today, December 16, 2010. There are only 33 lots in the sale — but most of them are important and high quality. 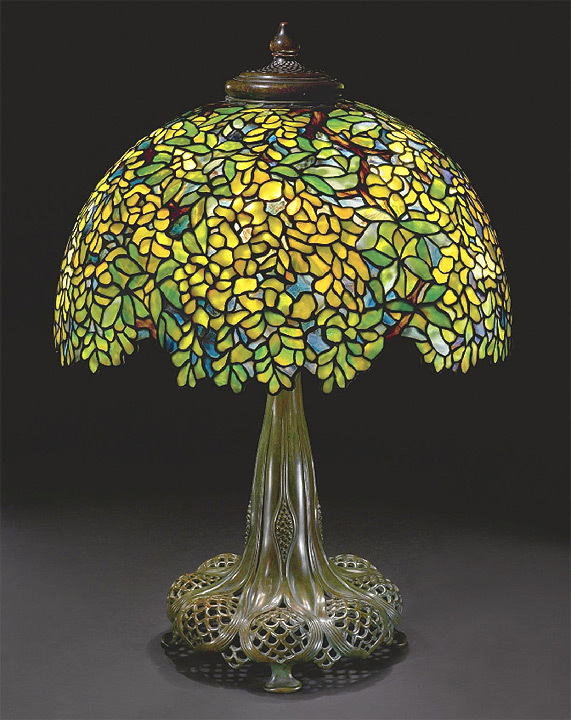 The offerings range from original oil paintings by Louis Comfort Tiffany to glass to lamps, like a Laburnum, lot 227. You would think their experts would be able to spot a fake Tiffany vase when they saw one, but lot 202, sneaked past them and into their catalog. 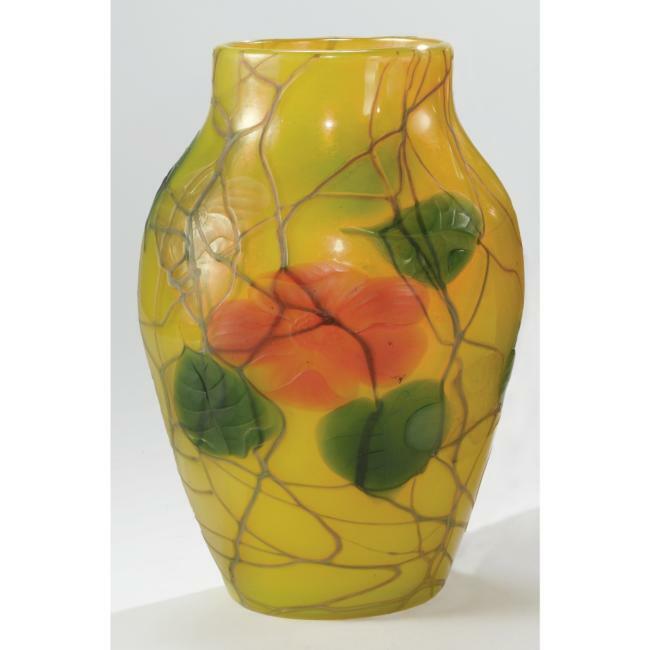 It’s listed as “A Superb Monumental Floriform Vase”, circa 1900, Favrile glass, engraved L.C. Tiffany-Favrile W2977, 16 5/8″ high. Provenance — Private Collection, Paris. $15,000-20,000. 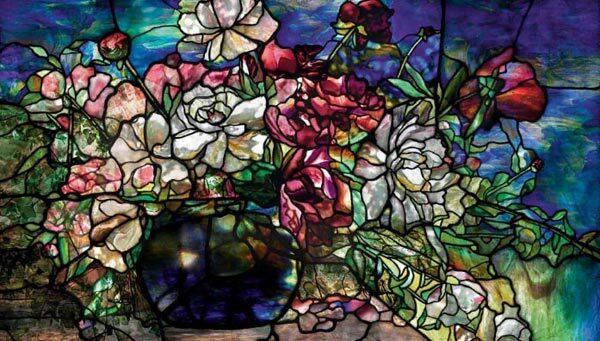 The only problem is that it’s not by Tiffany Studios, but a modern reproduction. Upon receipt of the catalog, I immediately doubted the authenticity of the vase, but waited to make a final judgment until I could see it in person. There was no doubt in person. The cup part of the vase was good quality, but the foot was all wrong. It’s a decoration Tiffany did not do. The signature was an obvious fake, of which, unfortunately, I don’t have a photo. I can only assume that the European consignor was an important client with other valuable objects, so the vase did not get the proper scrutiny it deserved. It’s rare for reproductions to get past their experts. Christie’s Tiffany results were excellent on December 15th, so I can only assume that Sotheby’s will be too. I’ll post blogs next week about the recent 20th Century sales in New York at the major auction houses. One item soared past estimates to sell for almost $1 million. 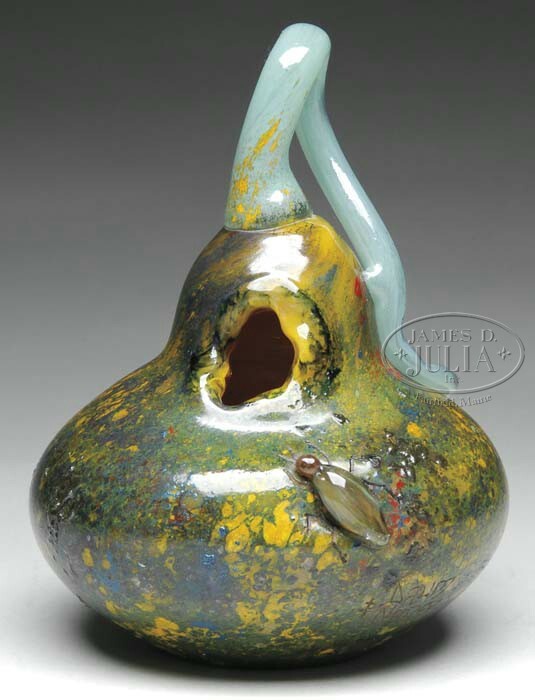 James D. Julia, Inc. held their semi-annual Lamp & Glass auction on December 1 & 2, 2010, with excellent results. Dudley Browne, the head of the department, told me he was very pleased with total sales of $1.9 million, against expectations of $1.3 million. He attributed the improved results to several reasons — new collectors, old collectors getting involved again, and realistic estimates and reserves. The sell-through rate improved to 85% — a significant increase over the previous couple of years. 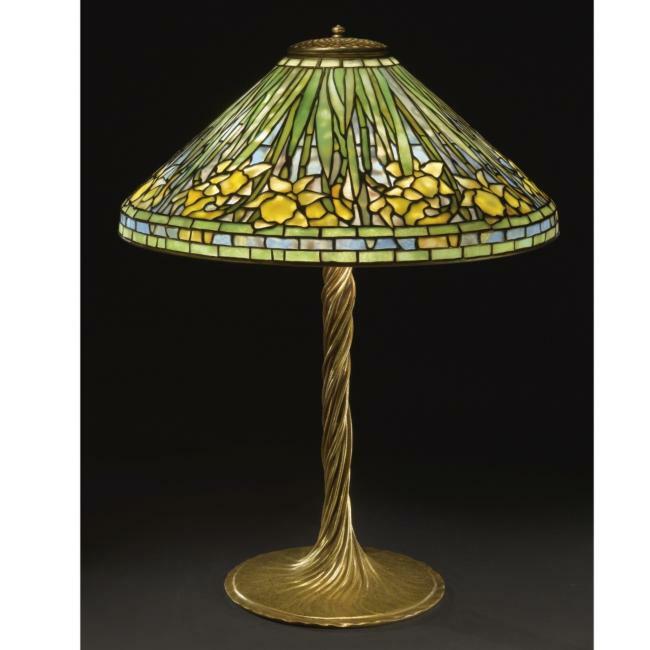 It was no surprise that the top lot of the sale was #2276, an estate-fresh Tiffany Studios Peony Border floor lamp with excellent color and in near mint condition. It was consigned by the children of the buyers who purchased it at an auction in the Midwest in the early 1960s. Estimated at $125,000-175,000, it sold for $172,500, including buyer’s premium. The top Tiffany Favrile glass lot of the sale was #2257, a rare aquamarine vase. Aquamarine vases are heavy as they’re nearly solid glass, with internal decoration, usually flowers or fish. This example was very nice, with yellow daffodils. The pre-sale estimate was $15,000-20,000 and sold for $34,500. French glass sold well, with a unique Daum gourd vase with applied insect selling best. It’s final price was $19,550 against a pre-sale estimate of $10,000-15,000. Painted lamps by both Handel and Pairpoint were weak. Prices appear to have regressed to levels not seen since the 1980s. For the complete sale results, click on the following link. Julia Lamp & Glass results. You will need to register first (free). James D. Julia, Inc. held their semi-annual firearms auction on October 5-6, 2010. Included in the sale was a rare shotgun made by the Ansley H. Fox Gun Company exclusively for President Theodore Roosevelt. Roosevelt’s son Kermit inherited it after his death, and then his son, Kermit Roosevelt Jr. In 1974, Kermit Jr., and the Roosevelt family decided to sell all of the family firearms. The Fox shotgun was sold to Thomas C. Kidd, a Fox historian. Then on February 22, 2000, Kidd sold the gun to an undisclosed buyer, who consigned the gun to Julia’s. The gun was sold as lot 1129 on October 5, 2010, for $862,500, the highest price ever paid at auction for a shotgun. 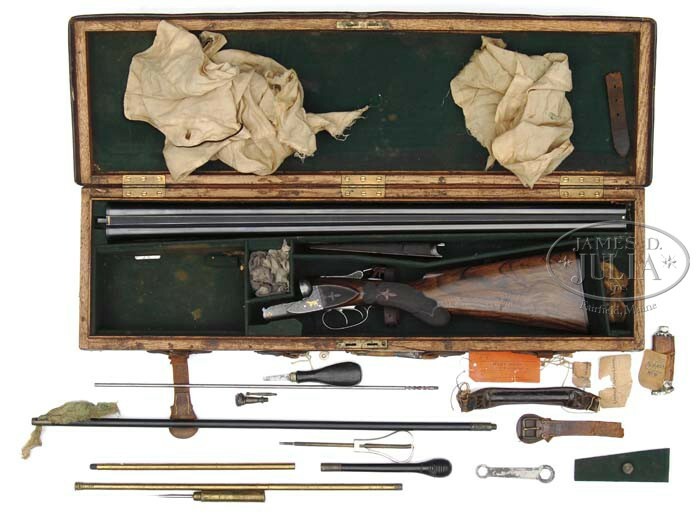 The quality of the gun, together with its impressive history and provenance proved irresistible to collectors. If you like my blog, please let your friends know by sending them a link. Then check out my new Daum, Gallé and R. Lalique acquisitions. I’ve listed them all on my website. I just listed another fifteen incredible Daum items, including swans, rain, and more in the last few days. Here’s the link. chasenantiques.com Then check out the huge sale I’m having on Icart etchings. For the complete listing, click this link. Available Icart etchings. Did you hear the story about a Batman comic book? Hard to believe. When Robert Irwin was 13 in 1939, he visited the local newsstand in Sacramento, California, to buy a comic book. Little did he know at the time the good fortune that would come of that purchase. The comic book was Detective Comics, #27, the first appearance of The Batman. Irwin paid 10¢, the standard price for a comic book in 1939. He put it away and forgot about it for 65 years, until 2004, when he discovered it in a box together with 1930s National Geographic and Popular Mechanics magazines. A collector found out he had the comic book and offered him $100,000. Irwin made another good decision in deciding not to accept the offer. Eventually the comic was consigned to Heritage Auctions to sell on November 18, 2010. It was listed as lot 92224, with a pre-sale estimate of $400,000+. The owner, Irwin, was in attendance at the sale. He had to be pleased with the final result of $492,937.50, including buyer’s premium. Not a bad return on his 10¢ investment. Irwin’s comic was graded 7.0 by Certified Guaranty Company. 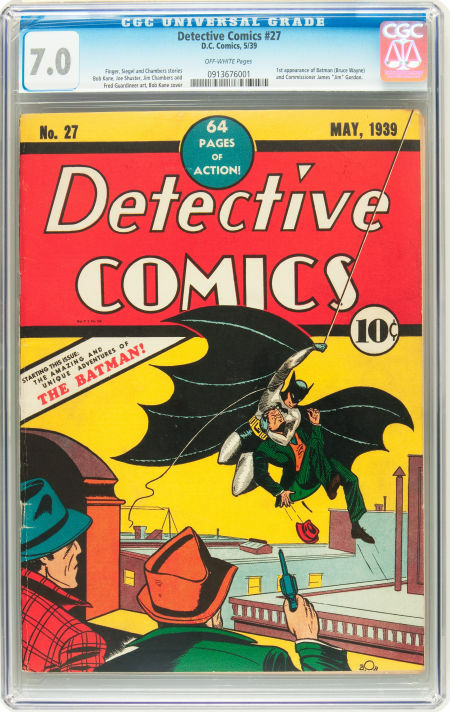 Heritage twice previously sold Detective Comics, #27 in better graded condition. On Aug 4, 2010, an example, graded 7.5, brought $657,250 and on February 27, 2010, another, graded 8.0, brought an incredible $1,075,500. When it comes to selling graded objects, like comic books and coins, condition is key. Slight differences in condition can make for dramatic differences in value.